eBay sellers, especially pickers, love the thrill of the hunt. Never knowing what we will find in a thrift store, garage sale, estate sale, or consignment store. There can be a nagging feeling not to leave anything decent behind because we know how much money we can make on items we are familiar with selling. Sometimes there are feelings of, "I will never find that again," or "Someone else might buy this so I better get it now." But, this hunter-gatherers instinct can backfire and lead to an accumulation of too much inventory in the home that isn't being listed. When shopping and inventory creep starts to interfere with daily living, relationships, and the eBay selling process, it can actually be a hoarding disorder disguised as a business. What Exactly Is a Hoarding Disorder? 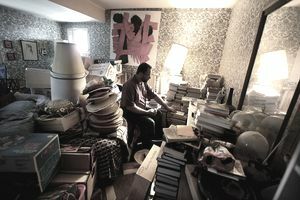 "Hoarding is the persistent difficulty discarding or parting with possessions, regardless of their actual value. The behavior usually has deleterious effects—emotional, physical, social, financial, and even legal—for a hoarder and family members. For those who hoard, the quantity of their collected items sets them apart from other people. Commonly hoarded items may be newspapers, magazines, paper and plastic bags, cardboard boxes, photographs, household supplies, food, and clothing." If someone is already susceptible to hoarding tendencies, an eBay business may be an excuse or justified reason to shop more, buy more, and collect more things. Here are some working signs that you or someone you know might be bordering on the edge of hoarding, and it might be time to address the issue. To function well, an at-home business should have its own space so that it is physically and visually separated from the rest of the home. A dedicated eBay area is helpful because it allows the seller to walk away from the business to take breaks, engage in family life, and basically have a life beyond the business. A separate space can include a separate storage building, a room with a door, an area that could be enclosed with a curtain or room partition, or even just plastic tubs where work can be put away and removed from sight when the seller isn't working. "This over here is my work area, and that over there is not." When unlisted inventory starts to "creep" into other rooms or areas, this is a problem. The activity of listing purchased items should stay in sync with the purchasing of new inventory. Boundaries need to be set to avoid inventory. For example, if the guest room is your eBay space, and it fills up, then you start storing unlisted inventory in your bedroom, it is time to take action. If you are feeling a loss of living space because inventory is taking over, it may be time to create new systems for shopping, listing, and storing your items. The only exception here is if you live in an area where inventory is hard to find and you purchase a large amount of inventory seasonally, such as during summer yard sales. Some sellers must stockpile inventory to list later because of limitations, not a hoarding disorder. Is there a method to the madness of your death piles, or are you accumulating inventory unintentionally? Visiting multiple thrift stores every day because you don't want to miss anything? Hitting garage sales even though you already have hundreds of unlisted items? Do you feel a rush or a high when shopping, but a sense of shame or disappointment in yourself later when you get home? Do you shop when you feel emotional distress, as a coping mechanism? Do you buy things you don't want or need just because they are on sale and you are getting a deal? Do you feel like the big sale or discount will never happen again? Do you have trouble organizing things when you get home? All of these can be signs of compulsive shopping or a shopping addiction. Remember that you came to eBay to sell things and make money. Yes, eBay is an enjoyable home business that is flexible. But it is important to set boundaries and keep them. The purpose of buying inventory to resell on eBay, is to produce income. Sure, some sellers are hobby sellers, and do eBay for fun, to re-home collectibles, or because they like having a small home business. But most of us are in it for the money. If you find that your focus shifts from listing items to constantly sourcing, you may have hoarding tendencies. If the thrill of the hunt outweighs your discipline to list the items you have purchased, your business is out of balance and it is time to either take measures to catch up on the backlog or stop using eBay as an excuse for shopping. There is nothing wrong with enjoying shopping. However, hoarding inventory clogs up cash flow. Let's look at the math. Let's say Lind has 400 items she purchased from Goodwill at $3 each. That is $1,200 she has already spent, or invested in her business, that isn't working for her. If those items were listed, and she can realistically expect just a $10 profit for each of those 400 items within 12 months, she is literally sacrificing a potential $4,000 in profit because she isn't getting those items listed. Another scenario: Tom has 1,000 items that he paid an average of $2 for at garage sales over the last year. That's $2,000 worth of inventory that he has already spent money on, that isn't working for him. If he sells each of those items for a $20 profit over the next 12 months, that is $20,000 in profit he is forfeiting because the items aren't listed and people can't buy them. All those bags and boxes of junk that sellers accumulate in their homes equates to lost dollars in inventory cost and lost future dollars in sales. Unlisted inventory is the most common way eBay sellers leave money on the table. While most eBay sellers today did not live during The Great Depression, some still have an attitude of lack rather than abundance. It may be that things were scarce during their childhood, or some other personal issue makes them feel like they won't be able to find inventory so they must stockpile or hoard it. Compulsive shopping can be caused by emotional issues, needing to fill a void in one's life or even seeking excitement. The world we live in today is one of abundance. We live in a society where things are disposable and most things we own can be replaced very easily and quickly. Especially with online shopping, anything anyone needs is just a click away. The waste stream in our country will not end soon. Thrift stores are bursting at the seams and more are being built every day all over America. Baby Boomers are downsizing so their decades of belongings are going to thrift stores in a steady stream. More and more people are becoming minimalists and giving away their excess belongings. There are thousands of thrift stores across America, and more being built every day. Finding inventory is never a problem. Getting inventory listed is the backlog for most sellers. It takes discipline, organization, and patience to be a successful seller on eBay. If you feel that your eBay business has become justified shopping and hoarding, or someone you love has this issue, there is help available. Shopaholics Anonymous may be a great resource and a place to start.